Cabo Nov 2014: Nov Trip Fiesta Guided Cabo Trip Fiesta 21st Annual Nov trip with 20 anglers fishing 2 days on 5 boats & 2 boats the 3rd day, returned with catches of , 11- Striped Marlin 120-150 pounds released, 2 Sailfish (released) 80-100 pounds plus 48- Dorados 15-23 pounds 48-Yellowfin 10-60 pounds, 4 Wahoo 20-30 pounds & 1 Skipjack Noted catches were on the Carolina for the 2 days, Warner Wells party from California fishing with skipper Beto, caught a total of 1 Striped Marlin, 6 Dorados, 18 Yellowfin & 1 Wahoo with the largest Dorado officially weighed at 22.8 pounds & the Wahoo 20 pounds. 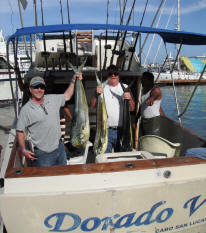 Also on the Dorado VII” Gary Hunts party of California fishing on with skipper Sammy caught 12 Dorado, 13 Yellowfin, 3 Wahoo & 1 Skipjack with the largest Wahoo offically weighed at 28.5 pounds. 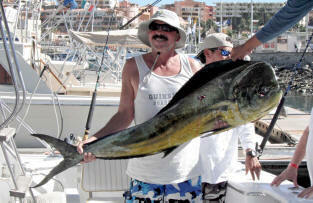 ​Fiesta Sportfishing 20th Anniversary trip - one of our biggest & best trips ever! 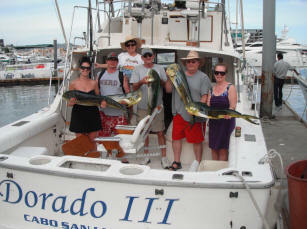 Cabo Nov 2011: Nov Trip sets pace with tons of Dorado catches for Fiesta Guided trips! Fiesta annual Nov trip with 17 anglers fishing 2 days on 6 boats & 2 boats the 3rd day, returned with catches of , 4- Striped Marlin 150-160 pounds , 2 Blue Marlin one at 175 pounds & one 250-300 pounds with all Billfish a whopping 76- Dorados! 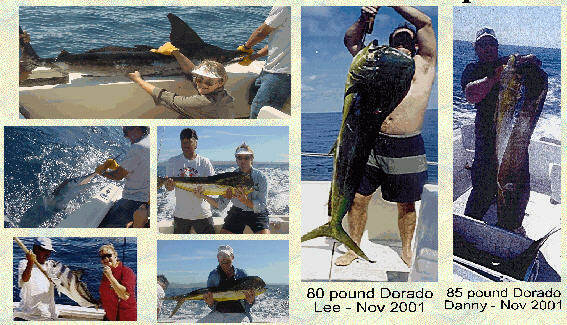 10-25 pounds, 10-Rooster Fish-10-15 pounds & 5-7 -Bonita 5-8 pounds. 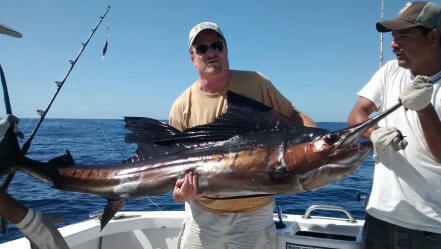 Noted catches where on Monday on the Dorado I Bob & Seth Obetz from Pennsylvania fishing with skipper Luis released 2 Striped Marlin 15-175 pounds along with catching 7 dorados with the largest Dorado officially weighed at 24 pounds - They took both the points & big fish jackpots for the day. On Tuesday Tom & Camile Sheppler from Michigan fishing with skipper Martin released a 250-300 pound Blue Marlin along with catching 2 Dorado taking the points jackpot. 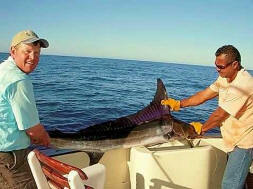 Tom took honors on the big Blue Marlin with a 2 hour battle before finally successfully releasing it. Fishing on the Dorado II Harold Rhoads & son Matt had 4 Dorado with the largest weighing in at 23 pounds for the big fish jackpot. 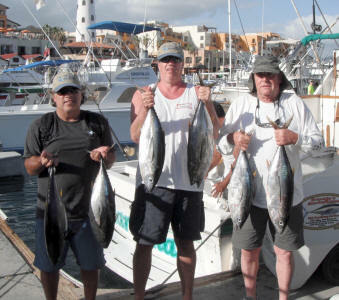 All of the boats averaged 4-10 Dorado per day with most caught on the Pacific side 15 miles or so from Cabo. 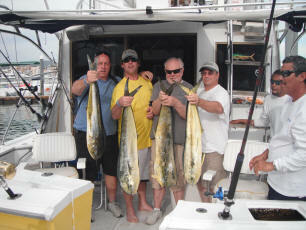 ​Our Oct 26-30,2008 Fiesta Fishing trip just returned. 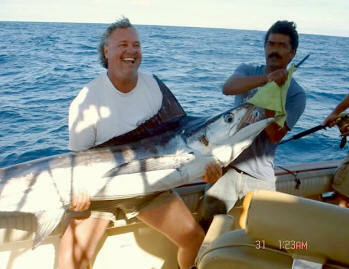 Although a light crew of only 18 Anglers due to the crazy Economy - Fishing was World Class for those who came. Fishing in our Jackpot where 18 anglers on 6 boats fishing Mon & Tuesday with 3 boats fishing Weds, we released 47 Striped Marlin, 3 Sailfish, 46 Dorado, 4 Yellowfin & 2 Rooster Fish. Top boat in the points was the "Dorado IV' with the Hunts & Barnes from Wickenburg AZ hooking 30 Striped Marlin between both days getting 22 to the boat for release with 8 that came unhooked or broke the line. The 2nd highest boat was the Gris Annel with Warner Wells group from LA with 12 Striped Marlin hooked in the 1st day with 9 brought to the boat for release. Top anglers for largest fish where on the "Dorado I" Ryan Doyle from MA with a 35 pound Yellowfin Tuna and the 2nd day Russ Dempster from LA on Gris Annel with a 31 Pound Yellowfin Tuna . Striped Marlin are stacked up out on the Golden Gate Bank right now with schools holding 20-40 Marlin - it is a sight to see & fish - don't miss it! Most all of our our boats have been recently refitted with Turbo Diesels that can make the run to any of the banks quite easily.The Dorado are spread out from the light house on up to Los Arcos. 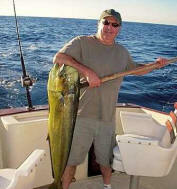 Most Dorado are small 5-8 pounds with an occasional 20-25 pound bull taking a marlin lure or bait. 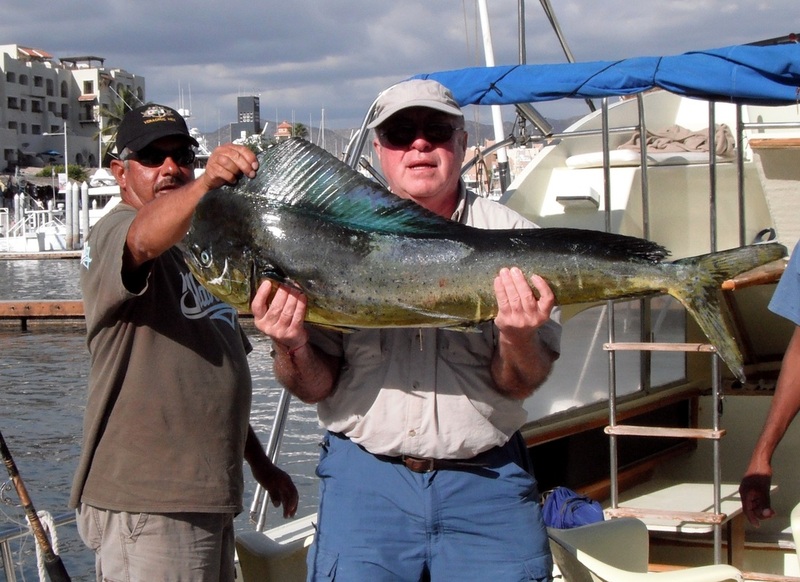 Keep in mind it is important to release the small females so we have good Dorado #'s next year. Tuna are in the area and being caught under the Dolphin schools although many of the schools only produced a few fish then they seem to get lock jaw - but not bad size in the 30 pound class for those getting hooked up. 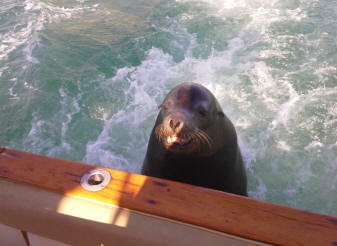 We still have space on our Nov 16-20th trip on sale for only $595 per person - so come & Join us in Cabo Today! Cabo Oct 2009: Cabo Oct 2009: Fiesta trip with 20 anglers fishing 2 days on 5 boats returned with 2 Striped Marlin 100-150 pounds,1 SailFish 80 pounds , 46 Dorado 5-25 pounds with many Released, 6 Yellowfin Tuna 10-15 pounds, and 10 Bonita 5-15 pounds. 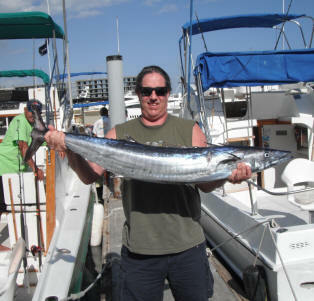 Angler on this trip opted not to have jackpot. Nov 15-19th 2009, Fiesta Trip just returned with 16 anglers fishing on 5 boats for 2 days, returned with , 5 Striped Marlin 100-180 pounds , 2 Sailfish 60-90 pounds, 2 Blue Marlin 150-270 pounds with all Billfish released, 52 Dorado 15-30 pounds,15 Yellowfin Tuna 10-15 pounds, and 2 Wahoo 15-60 pounds. 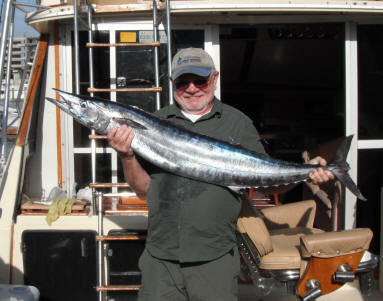 Best fishing was on the Pacific side with excellent Sea & Weather conditions. Our annual jackpot for most points and largest fish went as follows. 28' "Dorado II" with Tom & Camille Shepler from Michigan along with Travis Irwin & Erica Nielson from Arizona, took most points jackpot the 1st day with 11 Dorado and released 1 Sailfish. 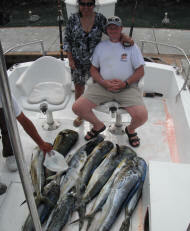 Largest other than billfish jackpot with to Wendy Rowley from Texas fishing on 33' Dorado III with a 30 pound Dorado. Second day points jackpot went to Gary Hunts group from California fishing on 40' Dorado VII with 2 Dorado, 13 Yellowfin and 1 Striped Marlin released. 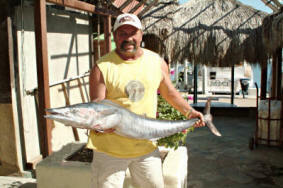 Second Day largest fish with to Mark Rowley from Texas on "Dorado III" with a 60 pound Wahoo.